Mix this ahead of time--stir all ingredients together with a wire whisk until evenly mixed--and store in a dated, labeled container with a tight-fitting lid. Makes about 7 1/2 cups of pancake mix. You only need about 3 cups for one batch. Use 3 cups of waffle mix and combine it with buttermilk, egg yolks, and butter or oil. Beat the mix with a wire whisk until just blended. In a medium bowl, beat the egg whites with a beater until stiff. Fold into other mix. 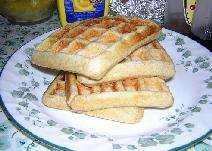 Bake on a waffle iron.